An aristocrat with a flair for the avant-garde, Hubert de Givenchy once created a signature fragrance designed for none other than actress Audrey Hepburn. It’s often speculated whether the fragrance led Hepburn to choose him to design her wardrobe, but without a doubt, Givenchy’s classic yet fearless approach to fashion breathed life into the heart of that era’s fashion. Thus began a lifelong friendship and professional collaboration between the two. When Givenchy asked Hepburn whether he could commercially sell the perfume he created for her, she initially replied, « Je vous l’interdis! » (“I forbid you!”). Fast-forward to 2018 with Givenchy’s revamping of L’Interdit, created by master perfumers Dominique Ropion, Anne Flipo and Fanny Bal. I recently received a bottle of L’Interdit, and opened the beautifully-designed bottle to a welcoming floral bouquet of orange blossom, jasmine and tuberose with contrasting earthy tones of vetiver and patchouli. The bottle’s redesign is a tribute to the original 1957 scent, with a striking, classic round square shape complimented by a black grosgrain bow and shiny 4G logo. It may be packaged in a simple black and white box but inside is Monsieur de Givenchy’s powerful, signature scent awaiting to be discovered. Todd Haynes, who worked with Rooney Mara on the set of the movie Carol, again collaborated with the actress on the fragrance’s Paris metro photo shoot. The chosen metro station for the shoot, Porte des Lilas, also happens to be l’interdit – closed to the public – and perfectly suits the atmospheric quality of the campaign’s imagery. 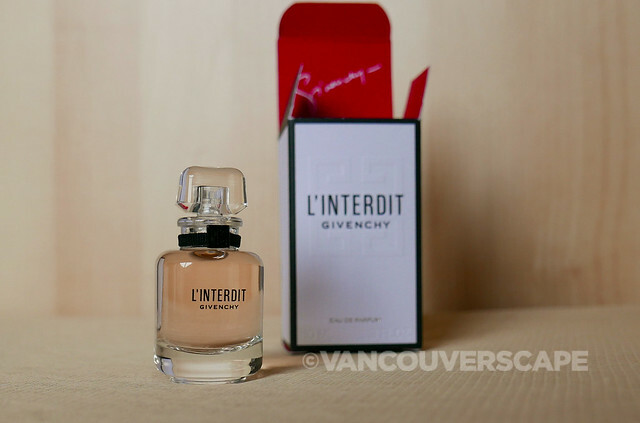 Find L’Interdit at Hudson’s Bay, Shoppers Drug Mart and Holt Renfrew in 35ml ($80), 50ml ($112) and 80ml ($131) sizes. Prices in CAD. Unwatermarked images courtesy of Givenchy.